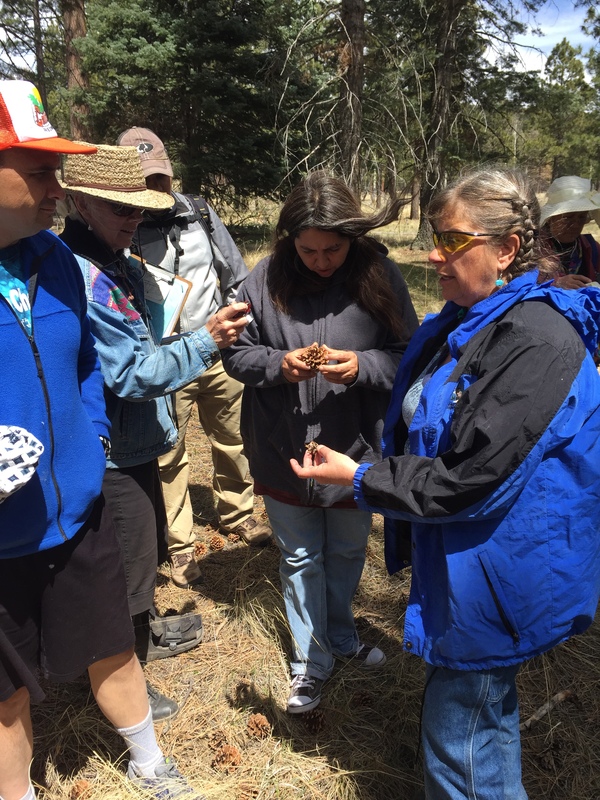 Last week NMWC staff and the teachers from our spring teacher training (part of the Improving Teacher Quality Grant from the Title II New Mexico Higher Education Department) gathered at Northern New Mexico College for a fantastic environmental education workshop hosted by Dr. Gerald and Grace Lieberman. 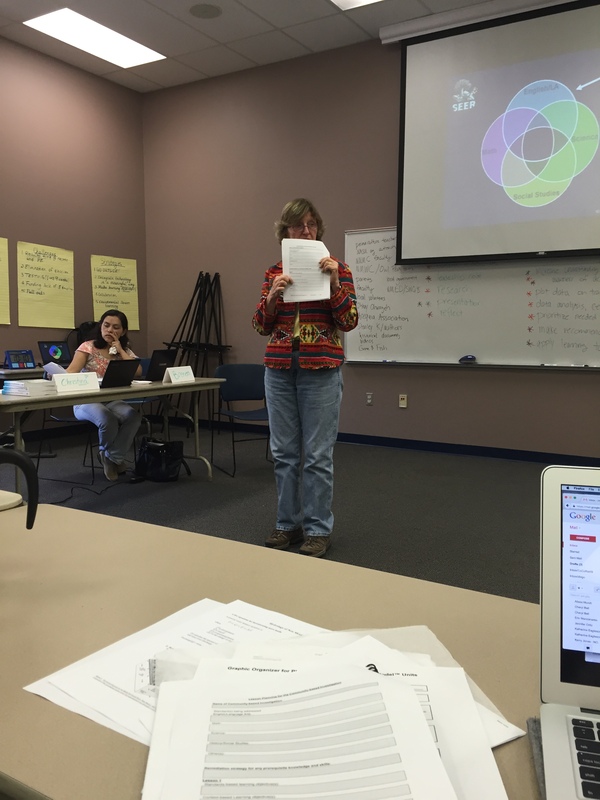 This workshop taught us how to use the environment as an integrating context (the EIC Model™) for teaching standards. The EIC Model™ uses the environment around the school, including the surrounding community, and student-centered, constructivist approaches to engage students while teaching the material that students are required to learn. We think it’s a fantastic idea, and it fits in to our teaching philosophy perfectly. The teachers who attended teacher training worked on putting together units for their classes this fall. Their students will be very lucky! At the end of the workshop, teachers presented their plans to the group. We can’t wait to see how these projects will turn out! If you want to know more about the EIC model, I highly recommend Dr. Lieberman’s book Education and the Environment. There are many reasons to support environment-based education, and this book highlights them. 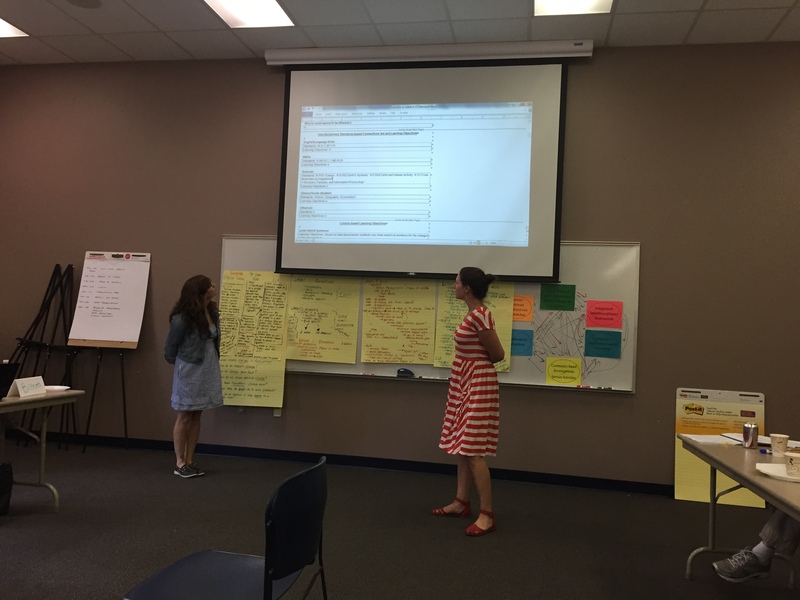 Last Saturday was our final weekend teacher training as part of the Improving Teacher Quality Grant from the Title II New Mexico Higher Education Department, which NMWC is hosting in conjunction with Northern New Mexico College. 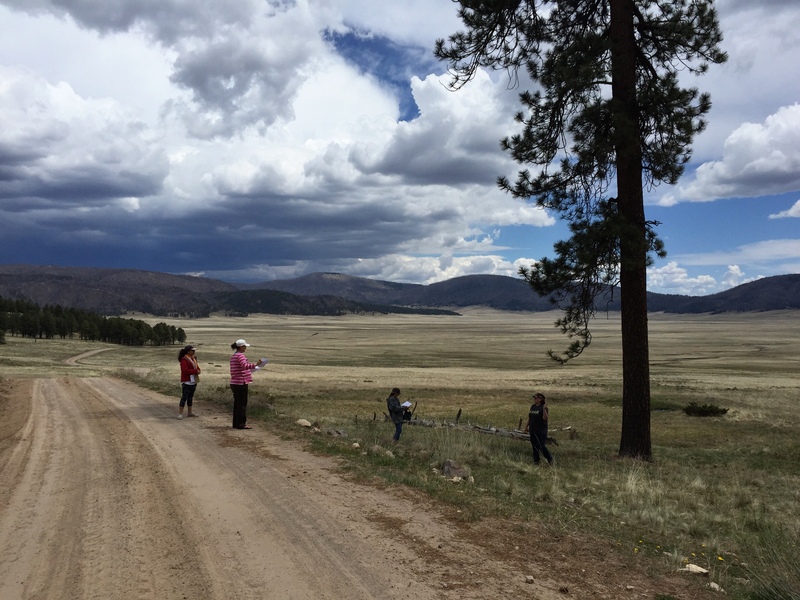 What better place could there be to end this series of science excursions than Valles Caldera? 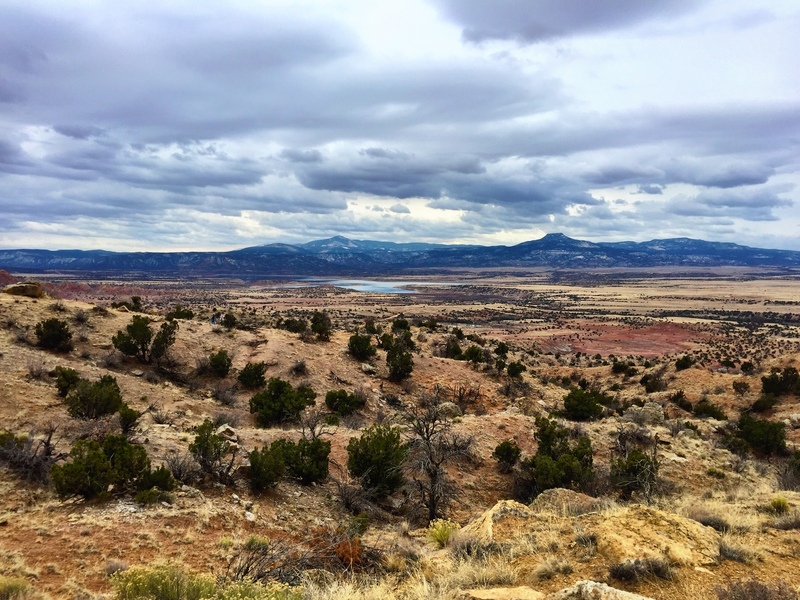 This weekend our focus was ecoregions of New Mexico. 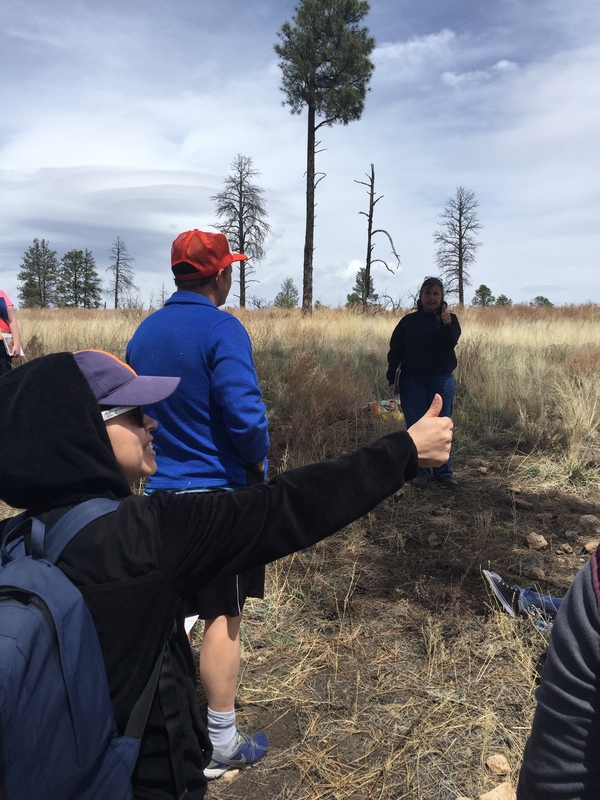 We touched on this several weeks ago with our Forestry and Wildfire day, but this time we got to experience several different ecosystems first hand. We began at the Highway 4 pull off looking out over the Valle Grande, where we briefly discussed how the caldera formed. Putting the caldera formation flash cards in order is so much more fun than you’d expect! 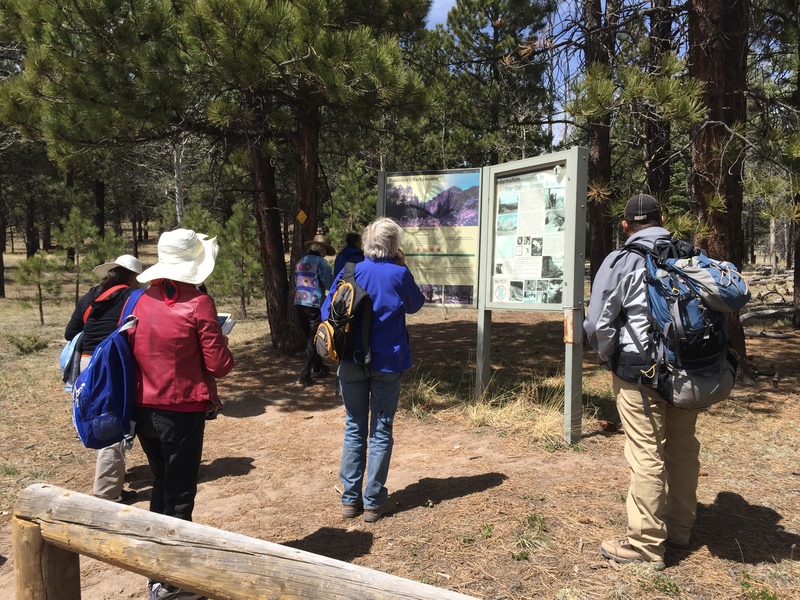 After this, we headed to the Valles Caldera visitor center. 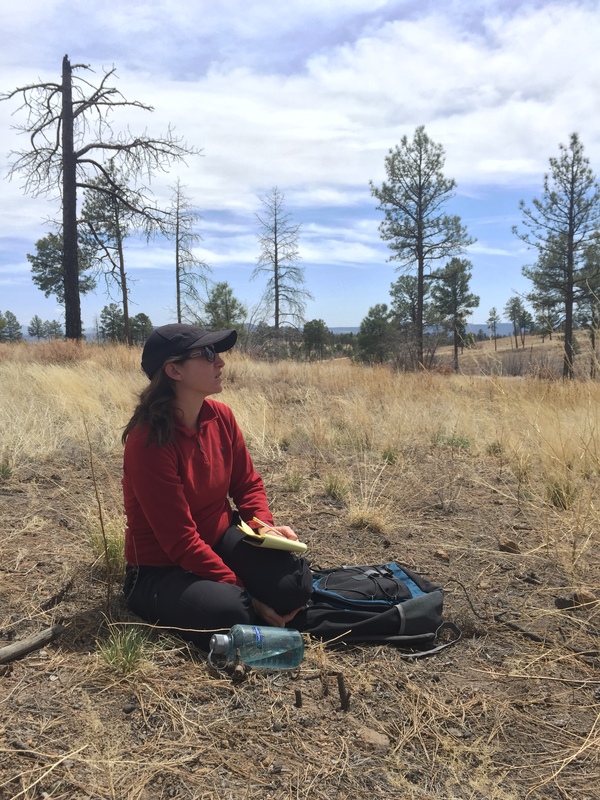 We found a nice place to sit in the middle of a prairie dog colony, and we discussed typical New Mexico ecosystems. 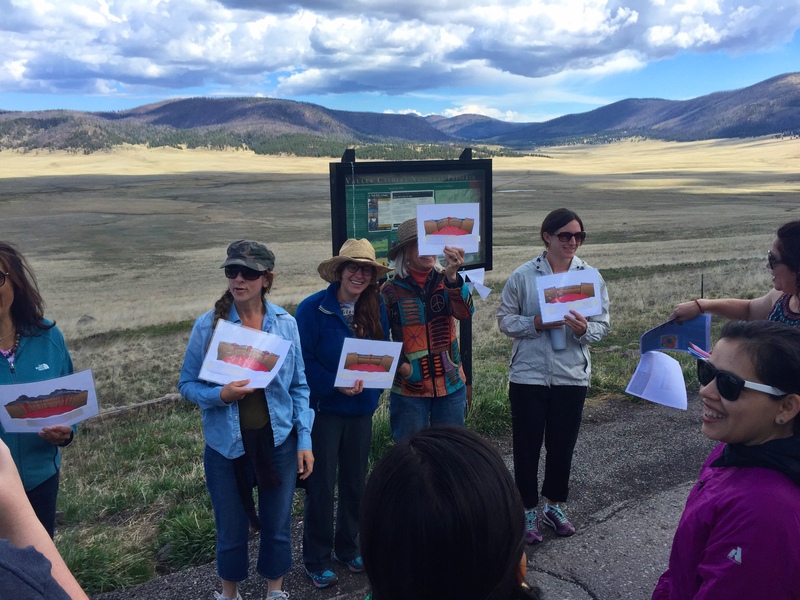 We also received a short introduction to the history of Valles Caldera from one of the tour guides. 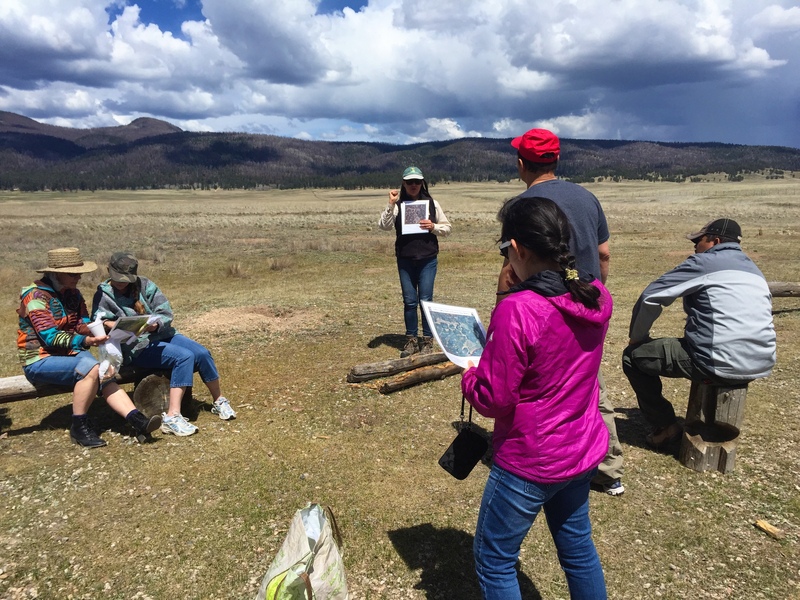 Expert tour guide Carmen explaining more about Valles Caldera. The prairie dogs around us were very entertaining during this time, and we got to watch a coyote watching the prairie dogs. Our next stop was History Grove (thanks to our educational use permit- the public is not allowed out to this point). On the drive out, we saw 10 elk running across a meadow, which was another fantastic opportunity to discuss larger animals of New Mexico. 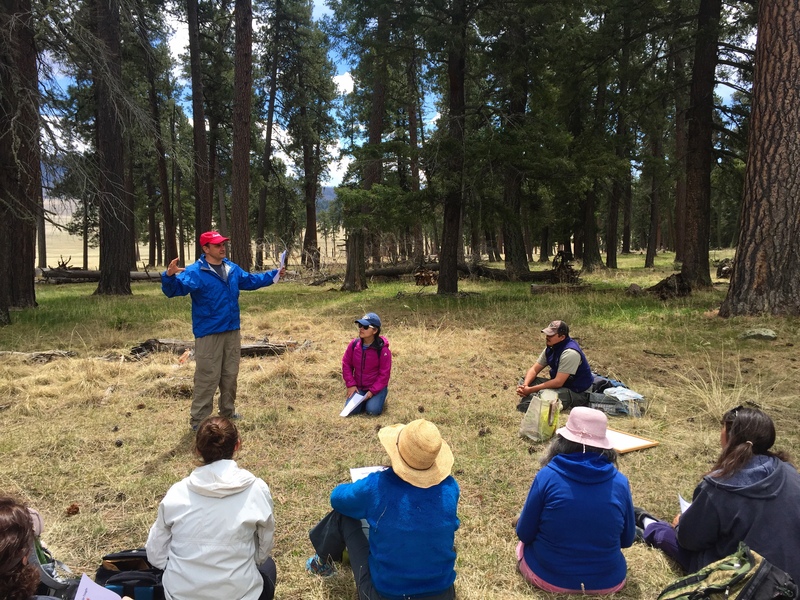 At History Grove, Dr. David Torres from NNMC showed teachers how to use shadows to measure the height of trees. Dr. Torres explains the procedure. Dr. Torres and Dr. Linnell test out the method. 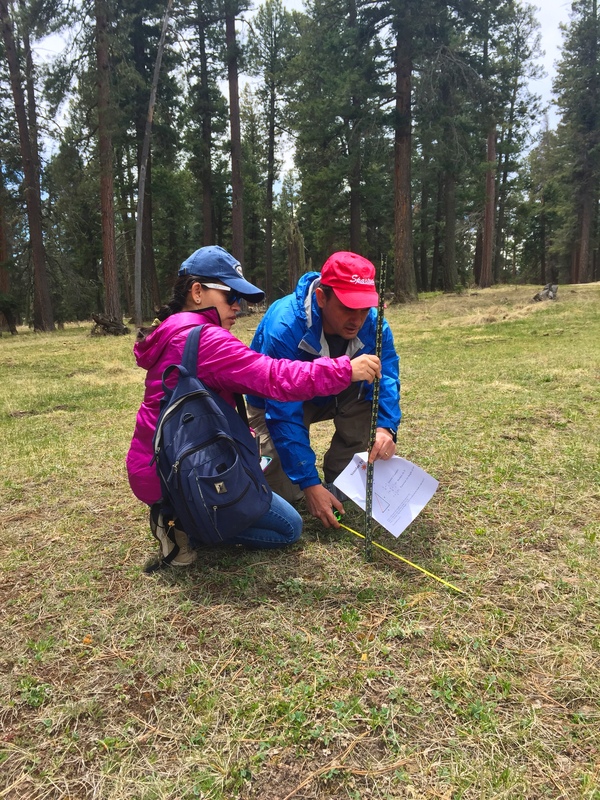 Teachers measure the shadow of a giant Ponderosa Pine. 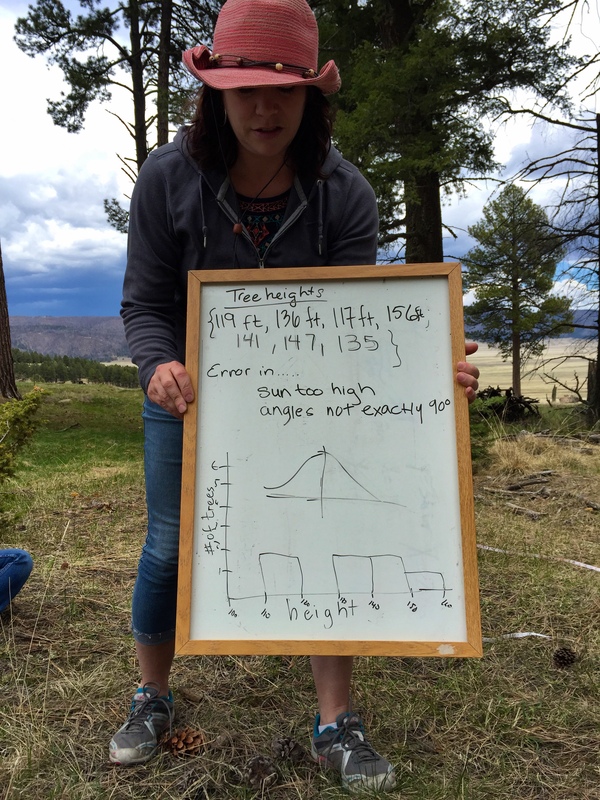 The teachers divided into groups, and each group used this method to estimate the height of at least 2 trees. This gave us a small pool of data, and we were able to plot the distribution of these tree heights. This plot lead to an excellent discussion of graphing data. After discussing trees, we moved on to wildlife. 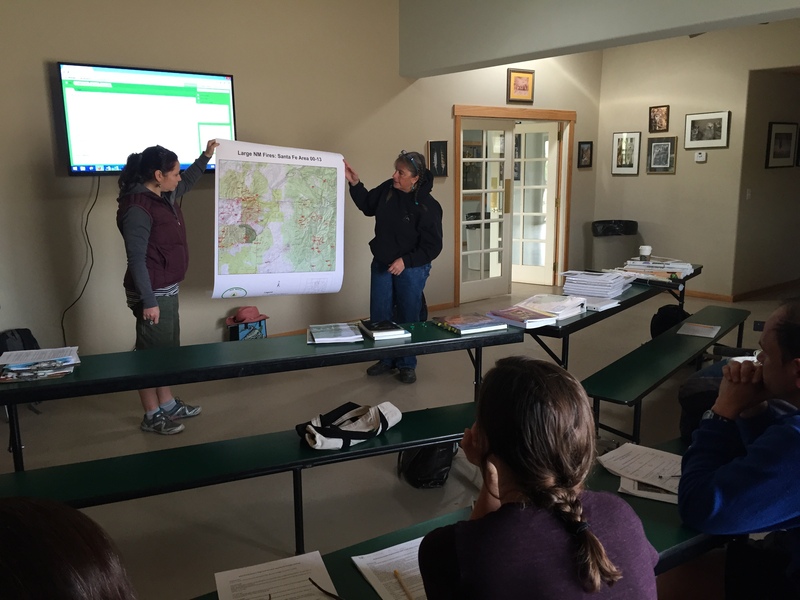 Dr. Pedro Chavarria showed the group different ways to survey animals by trapping and tracking with collars. A teacher examines a tracking device for a fox. Our next activity was a population estimate of an “animal species”. In this example, our “species” was black beans. White beans were the “marked” members of the population. By randomly selecting a number of beans from the population in a plastic container, teachers could mathematically estimate the total number of beans using the Lincoln-Peterson model. Dr. Chavarria explains the activity. During this activity, we were treated to a fairly up-close view of a very vocal Northern Goshawk, which was the highlight of the trip for many participants. It was another fantastic day of learning science with these teachers, and we’re looking forward to our summer institute where we take this new knowledge and apply it to teaching science standards! Last Saturday was our third teacher training as part of the Improving Teacher Quality Grant from the Title II New Mexico Higher Education Department, which NMWC is hosting in conjunction with Northern New Mexico University. 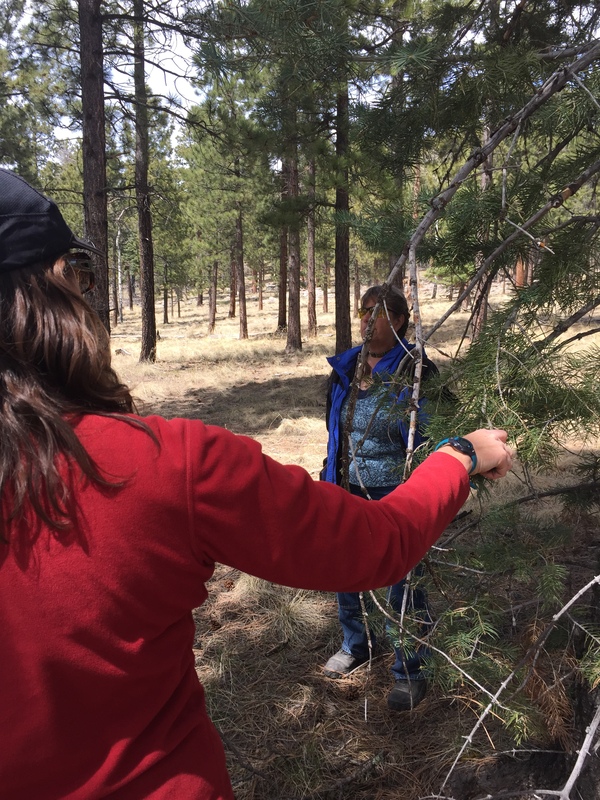 We’ve covered geology and water in New Mexico, so this time we were on to forests and wildfire! 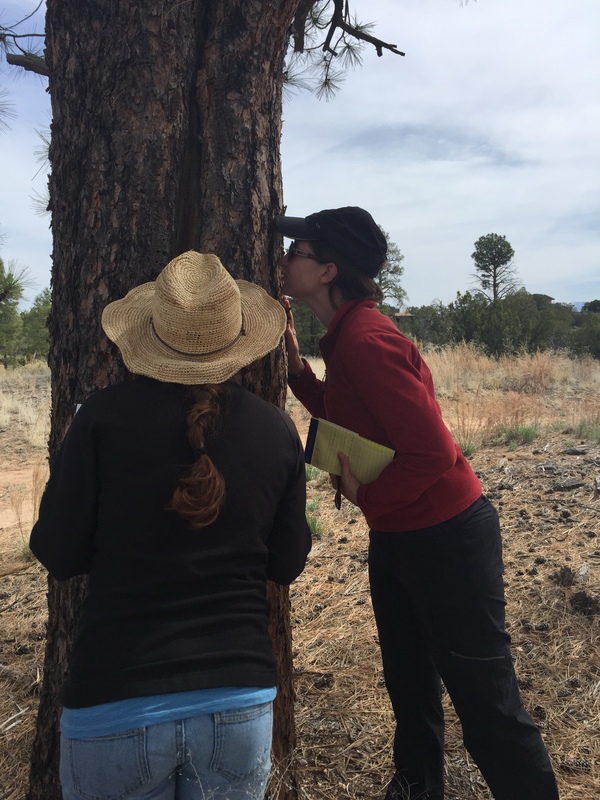 Our expert this week was Mary Stuever, who currently works for New Mexico State Forestry, although she’s worn a number of different hats during her career, including wildland firefighter and author. We began the day at NMWC, where Mary took advantage of the internet to show the group a few Youtube videos of flooding after wildfires and wildfire plumes. Mary made a fantastic map that shows all of the wildfires since 2000 that we can see from NMWC. Checking out the map of nearby wildfires. After these initial explanations, we hit the road! 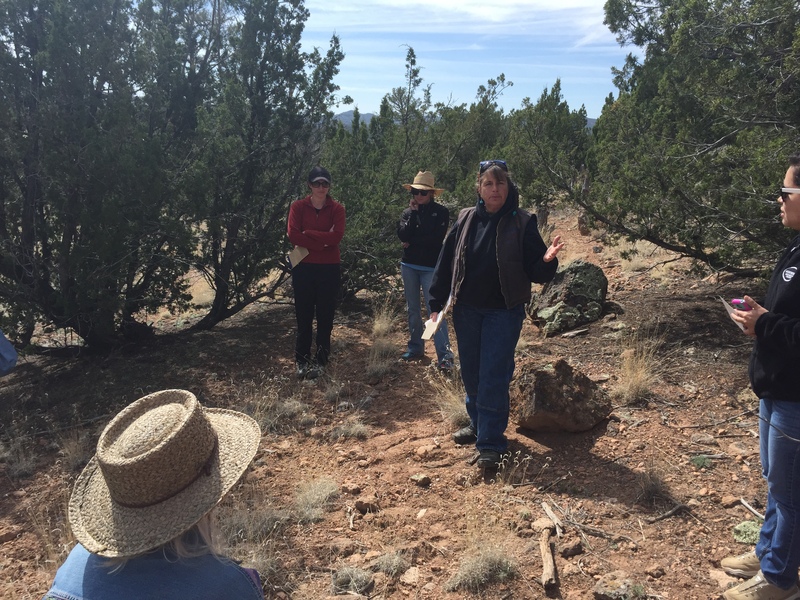 Our first stop was an area of pinyon-juniper outside of White Rock. 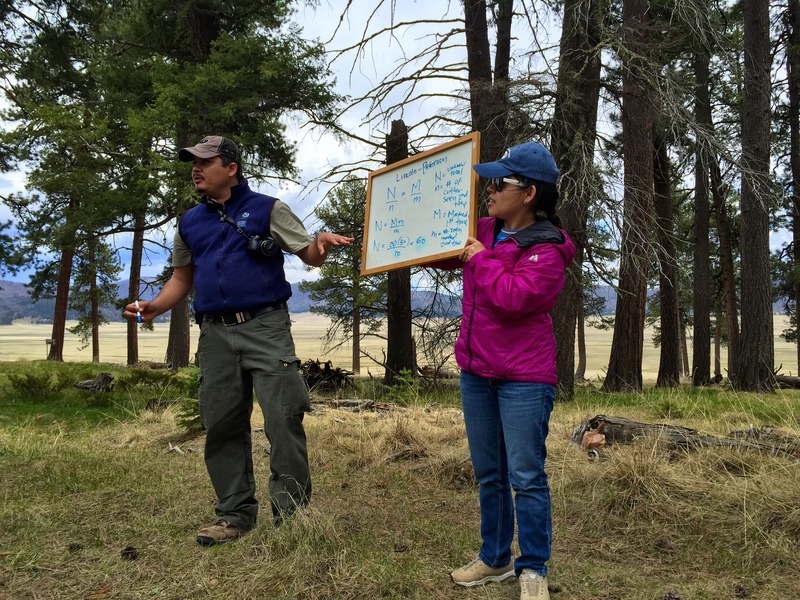 We explored this area and made observations as a group, and Mary explained the pinyon-juniper ecosystem. We used all of our senses to observe the trees! Walking into the ponderosa forest. Using our thumbs to determine which trees are in or out of our study plot. 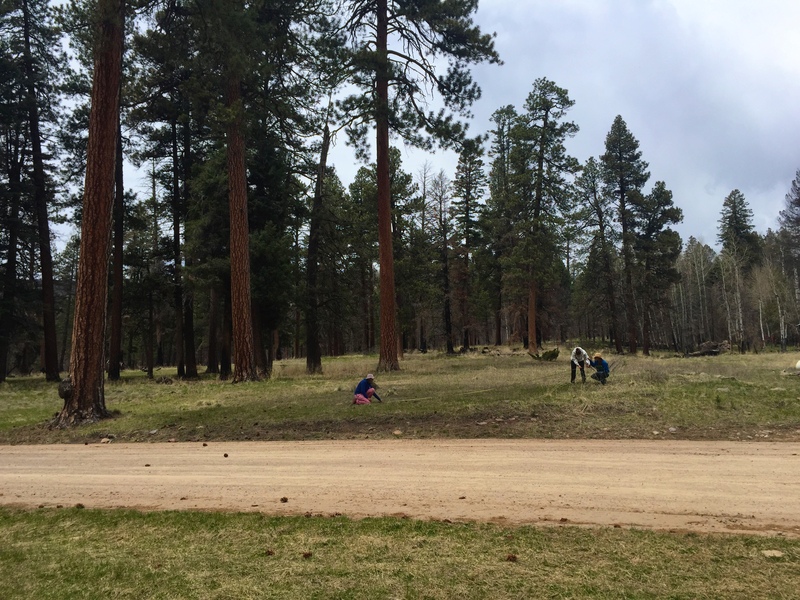 Recording observations of the ponderosa pines. 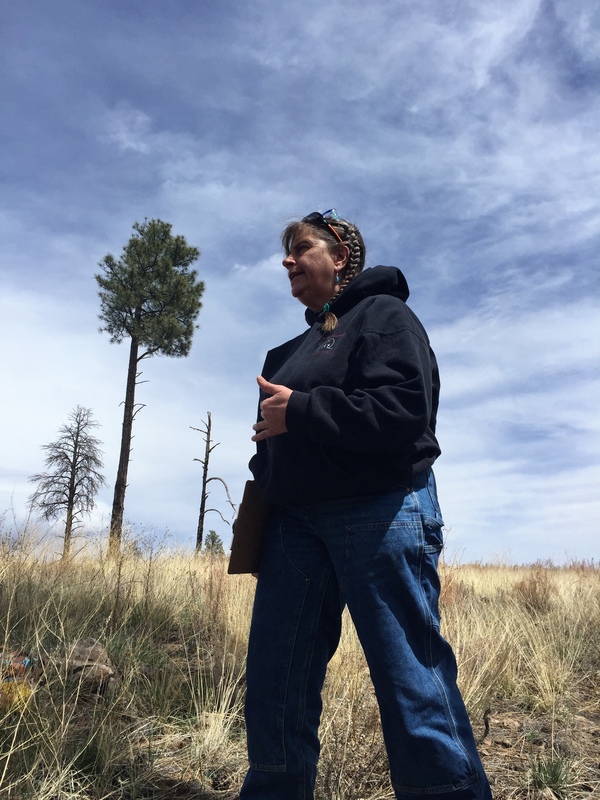 Our final stop was the Cerro Grande trail in the Jemez, where we discussed the Cerro Grande fire and the devastating Las Conchas fire. Most of the group lived in New Mexico during the Las Conchas fire and were familiar with the incident. We drove past areas that were absolutely devastated by the fire. The fire that burned through the area we explored was not quite as intense. 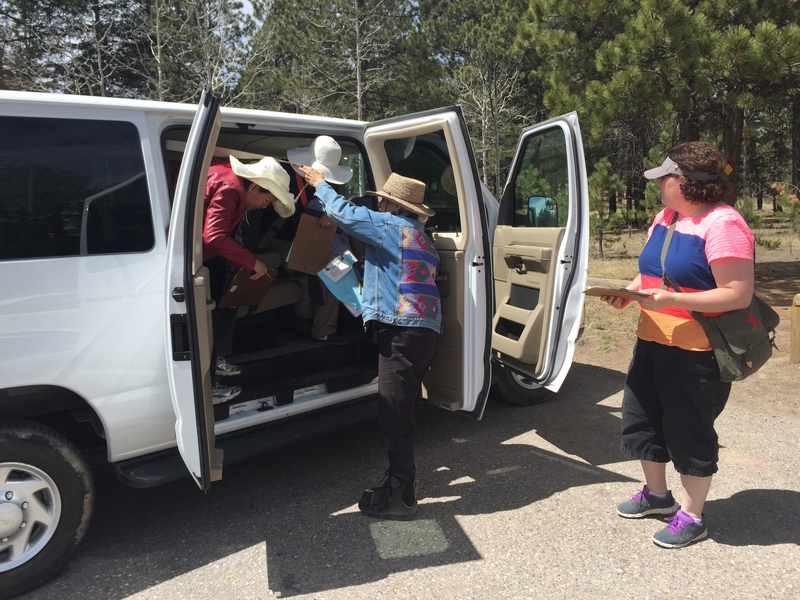 Piling out of the van at the Cerro Grande trailhead. 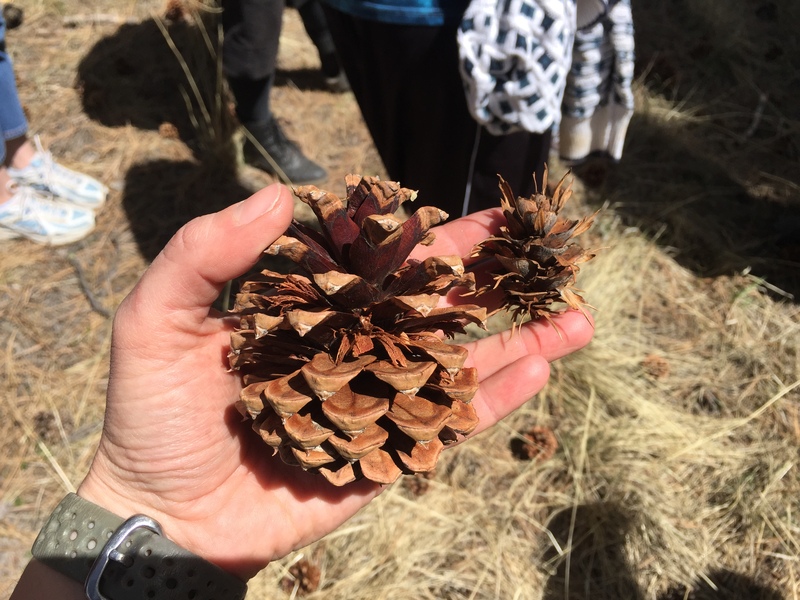 Pinecones from a ponderosa pine and a Douglas fir. Walking around an exclosure, which had a different variety of plants than the outside meadow. 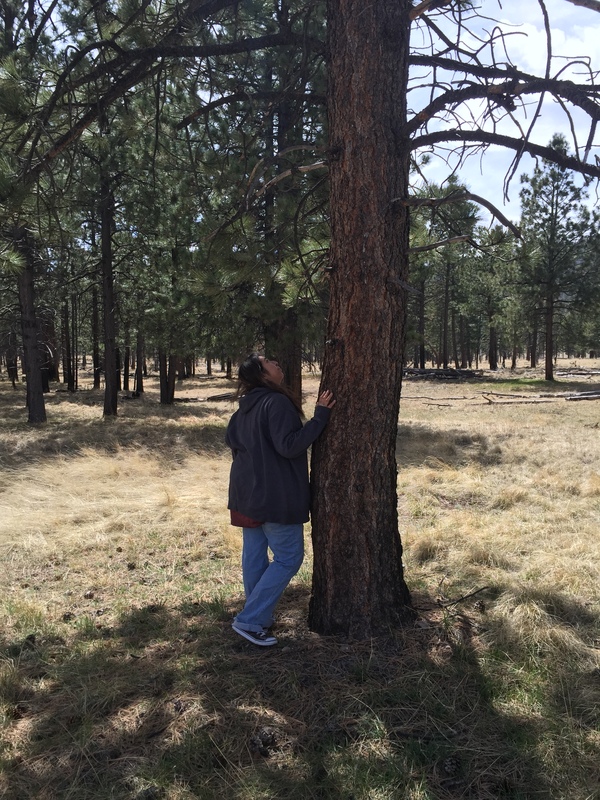 Taking a closer look at the bark of the ponderosa. One of my favorite activities that Mary modeled was using all of your senses to look around you. 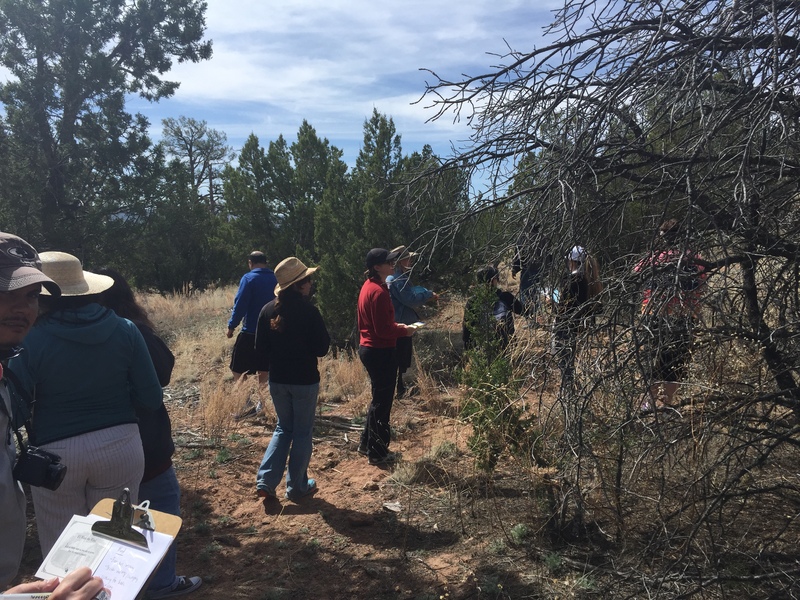 Because we observed several different ecosystems, we all got a glimpse of the variety of forest in this area of New Mexico. We also came away with a renewed understanding of wildfire and how the density of our forests is making this issue worse. 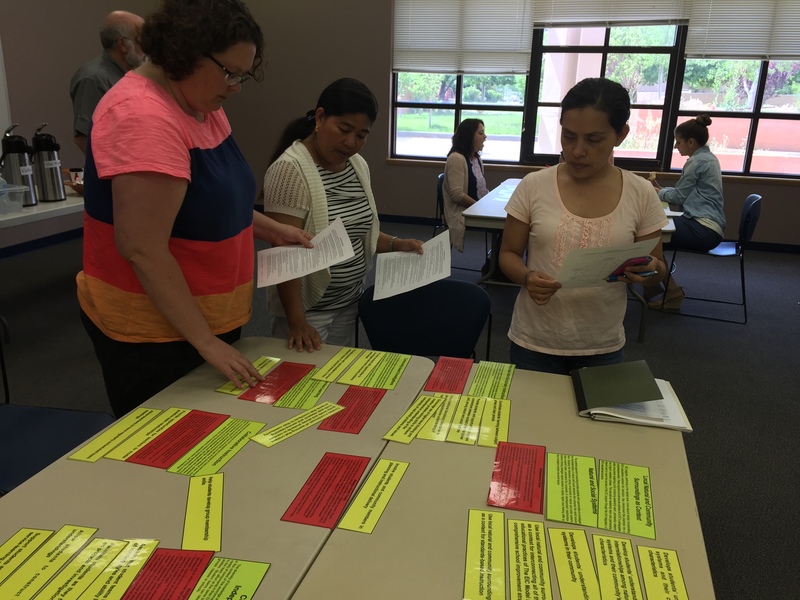 Last Saturday was the second in our series of Saturday teacher trainings for the Improving Teacher Quality Grant from the Title II New Mexico Higher Education Department, which NMWC is hosting in conjunction with Northern New Mexico University. Last month we discussed geology. 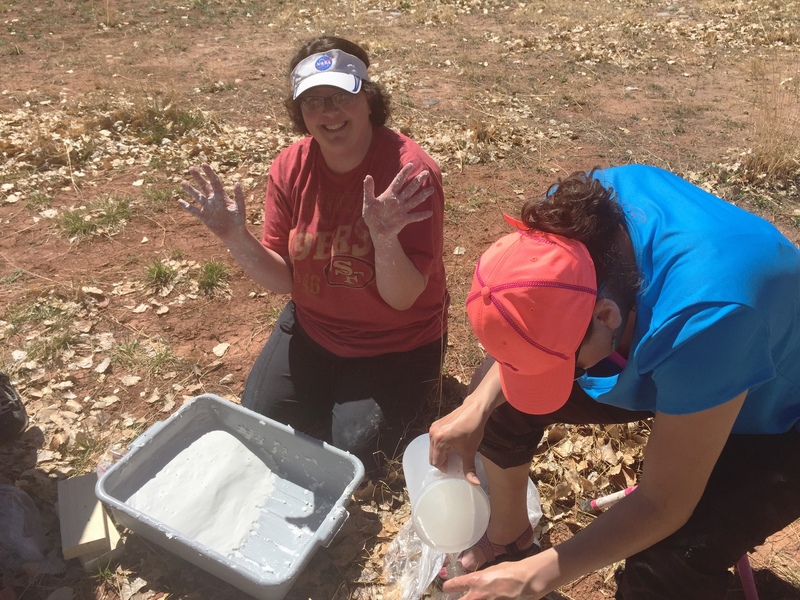 This month we moved on to a very important topic in New Mexico- water! We headed up to Abiquiu Reservoir. 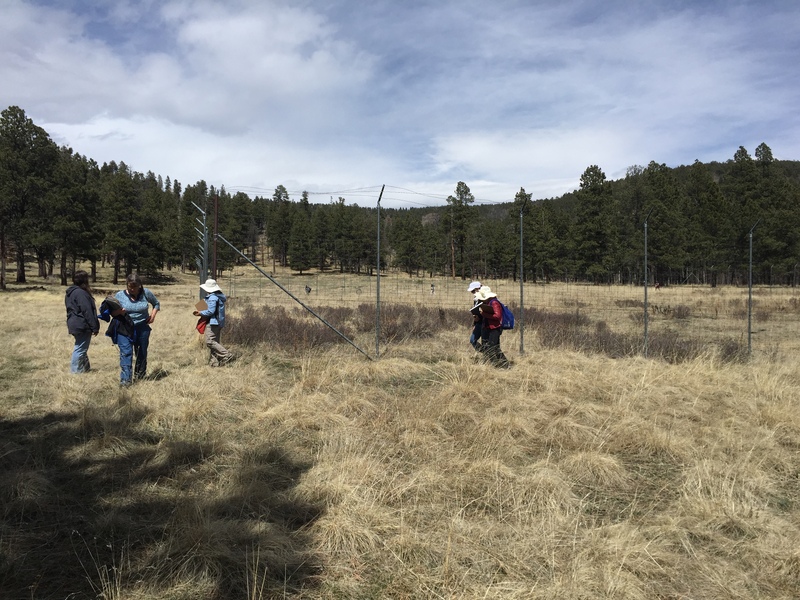 NMWC is fortunate to have a fantastic partner in the US Army Corps of Engineers (USACE) at Abiquiu Dam, and a few rangers helped out with training. 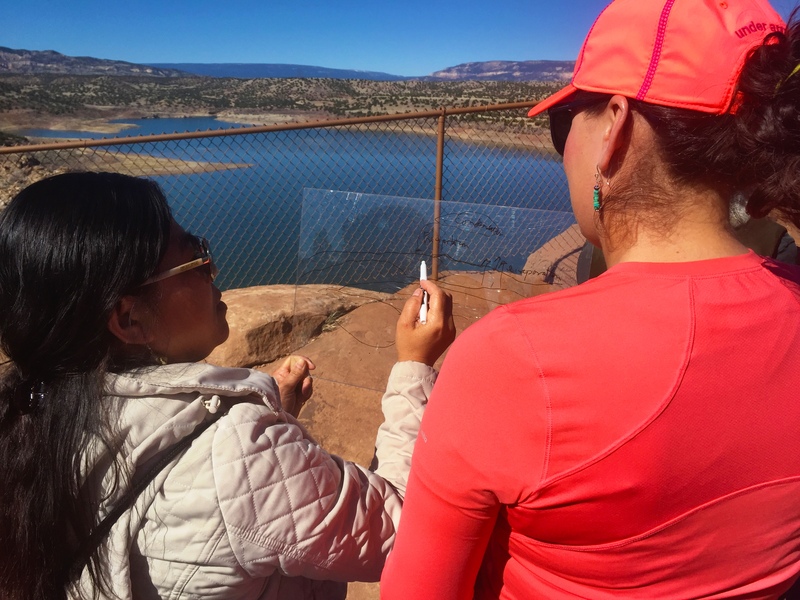 Two teachers practice drawing landforms on plexiglass. Our first activity was one of our favorites- drawing landforms while looking through plexiglass. As in River Classroom last week, simplifying the shapes of the landforms allowed our teachers to notice important differences in the scenery around us. They correctly identified the path of the Rio Chama upstream by noticing the Rio Chama canyon. 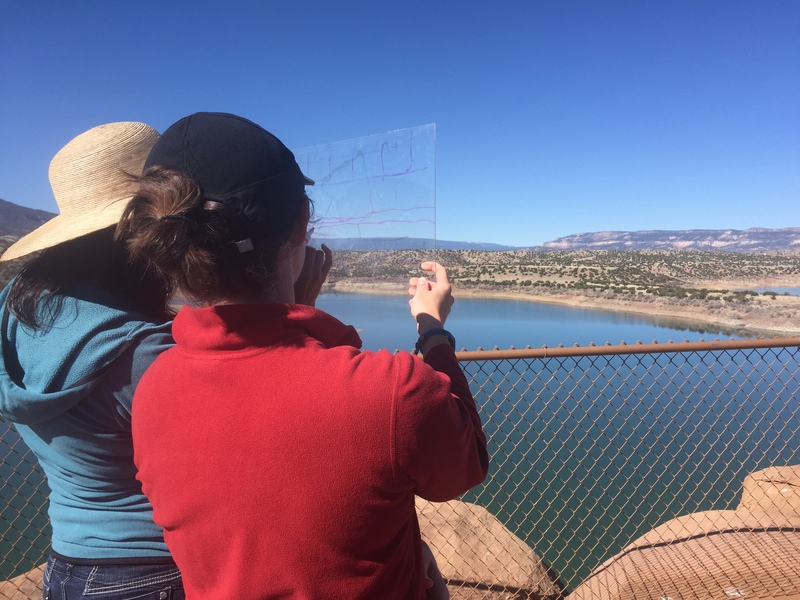 Sketching landforms at Abiquiu Reservoir. We also examined maps of New Mexico and discussed not only the concept of watersheds, but which watersheds we live and go to school in. Next we headed into the Abiquiu Lake Visitor Center, where ranger Austin Kuhlman explained how USACE manages our water. 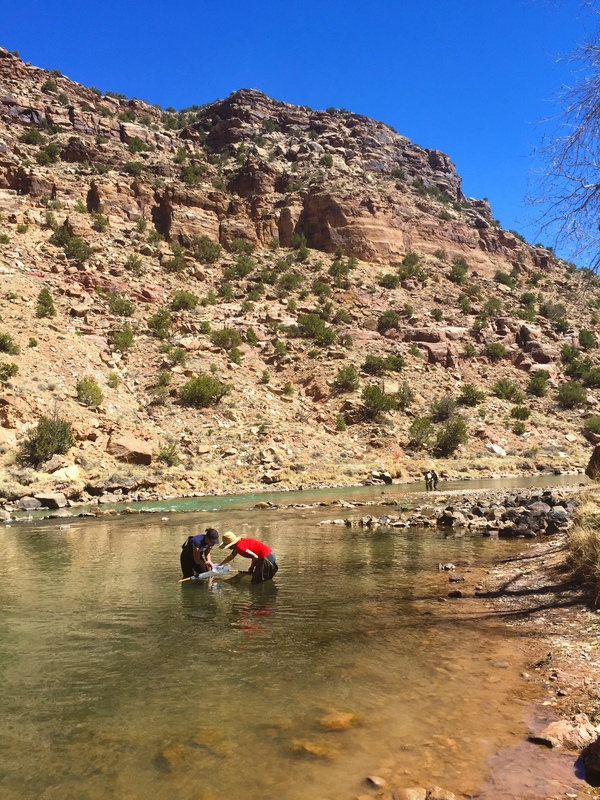 Most people don’t realize that the Rio Chama and Rio Grande carry more than just native water. The San Juan-Chama project carries water across the Continental Divide from the western San Juan mountains. 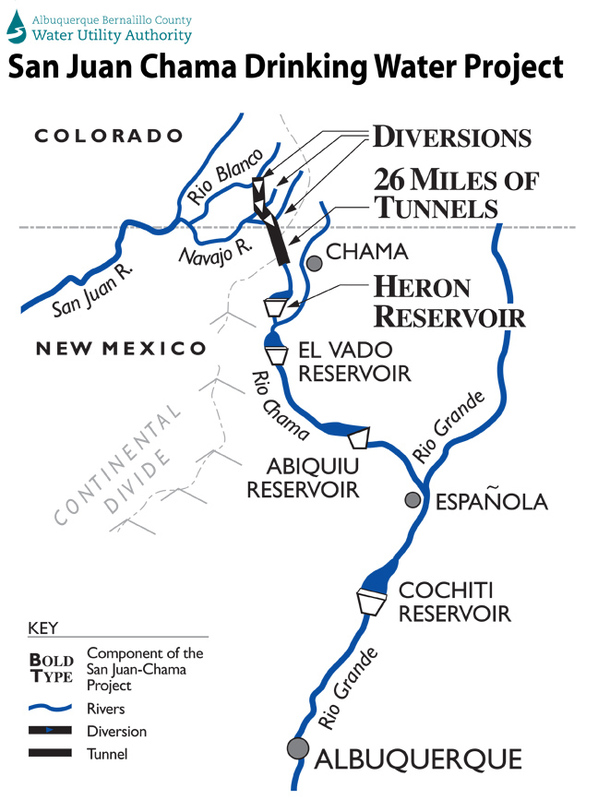 A map of the San Juan-Chama project. 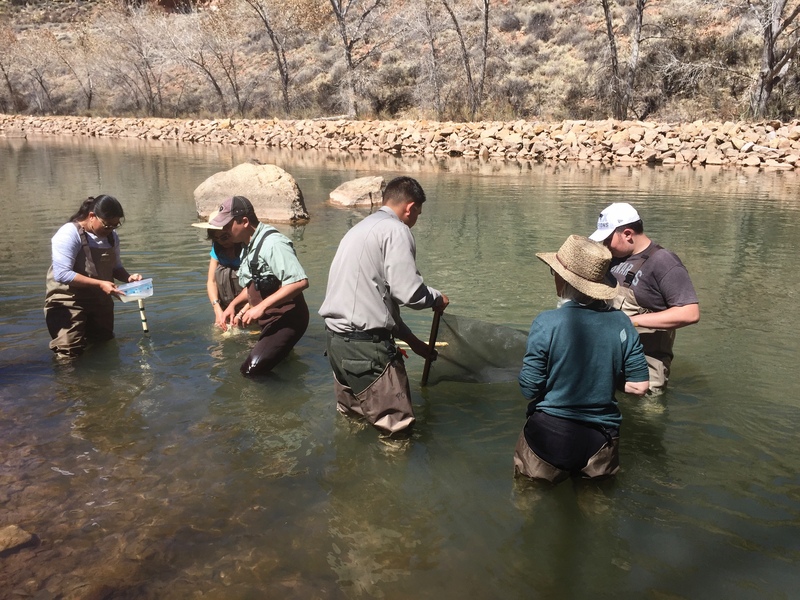 Ranger Kuhlman also explained a few intricacies of the Rio Chama ecosystem, including what USACE is doing to prevent the spread of zebra and quagga mussels. Ranger Kuhlman displays a length of PVC pipe that is covered in quagga mussels. After a quick lunch break, we grouped back up for a brief overview of acequias. 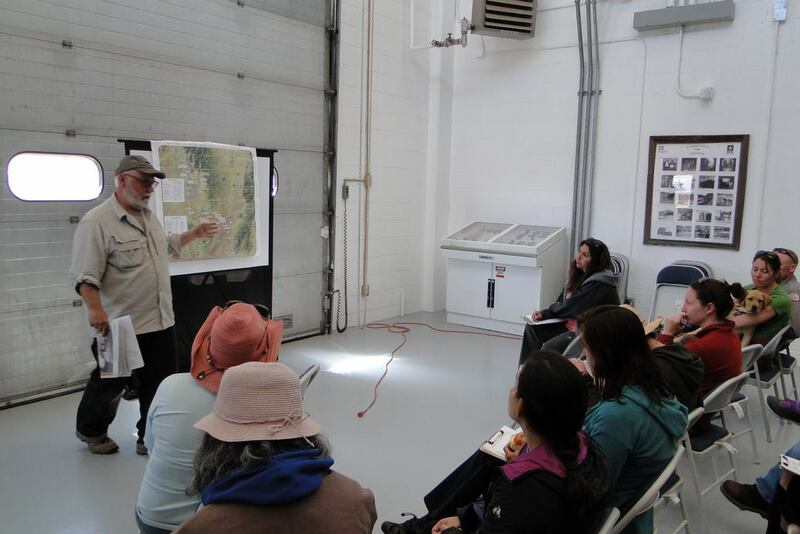 Tim Seaman, the commissioner of the Abeyta-Trujillo Acequia, shared his knowledge of the acequia system and its history. Tim Seaman explains the ins and outs of acequias. After all of this talking, it was time to get outside and move. We set up three stations. 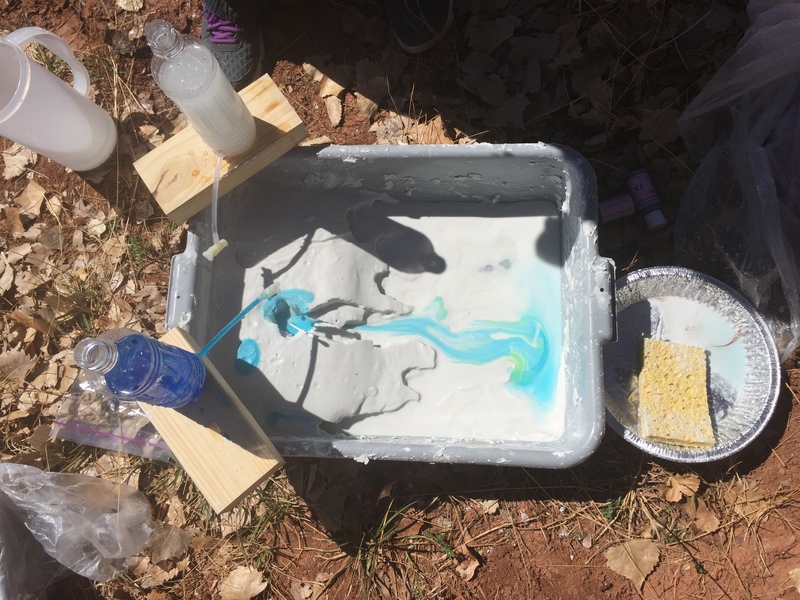 The first station used some really neat stream table activities from the River Cutters workbook, which was generously loaned to us by the New Mexico Museum of Natural History. These complete kits are available to be checked out by local teachers. 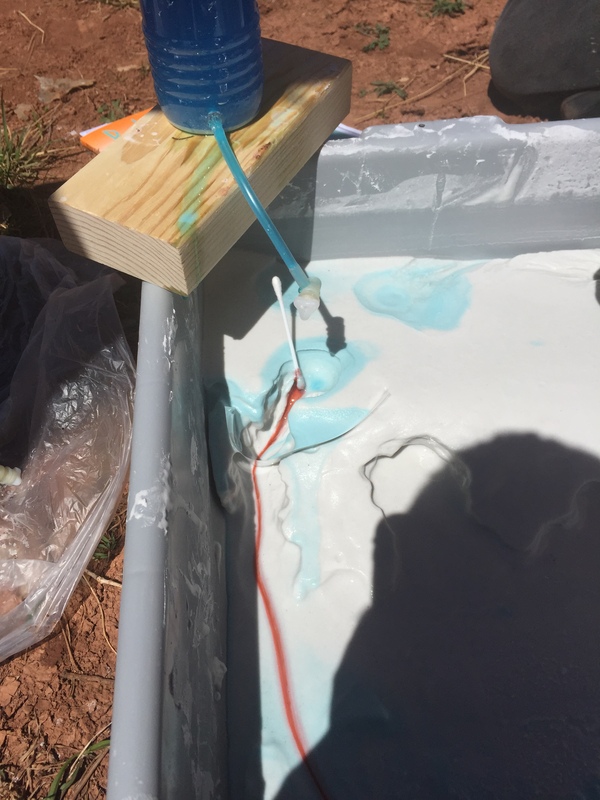 They use diatomaceous earth as a medium, which is unlike any other stream kit I’ve seen. They’re small and portable, easy to use in groups, and in my opinion, they are very, very effective at teaching many concepts. One of the stream tables set up. These kits are doubly fun because you can get your hands messy! Red “toxic waste” has leached into our river! 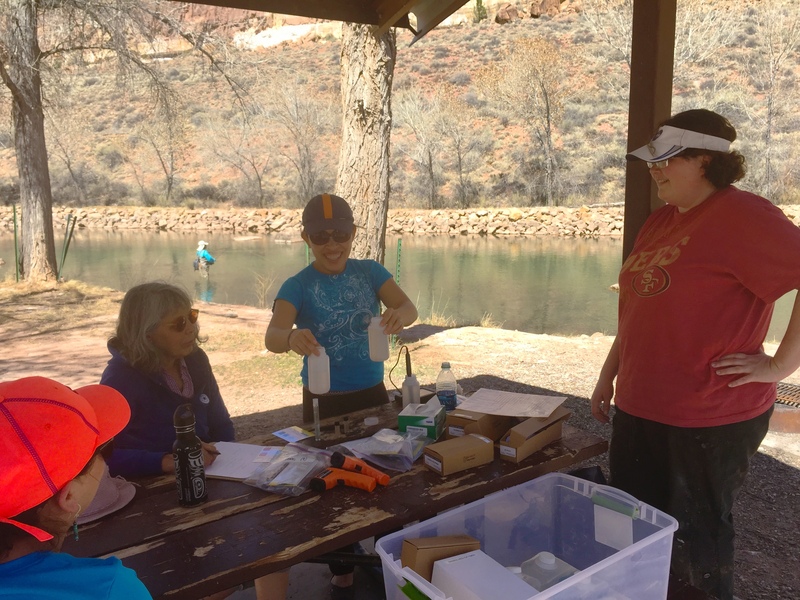 The second group used several different methods to test water quality in the river. Dr. Brenda Linnell from NNMU helped out with this group. Dr. Linnell explains the chemistry of testing water quality. 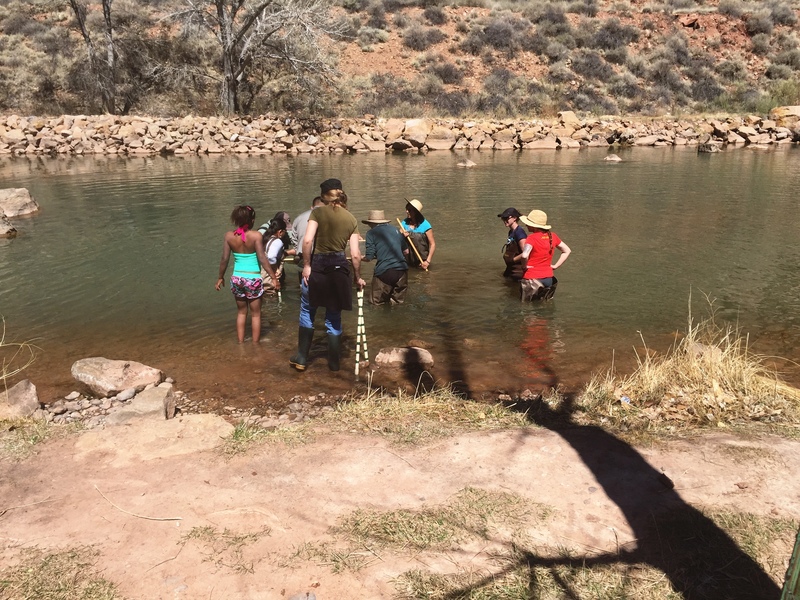 The final (and let’s face it- most popular) group learned how to wade in the river and collect benthic macroinvertebrates. Dr. Pedro Chavarria helped out with this group and explained how to identify the tiny bugs. Ranger Naranjo helps collect benthic macroinvertebrates. Almost everybody got in the water. 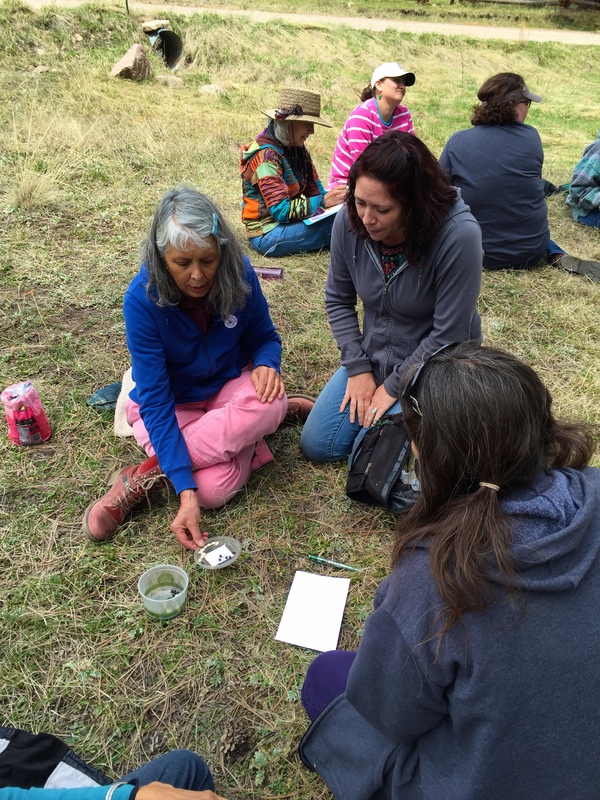 Two teachers examine benthic macroinvertebrates in a kick net. 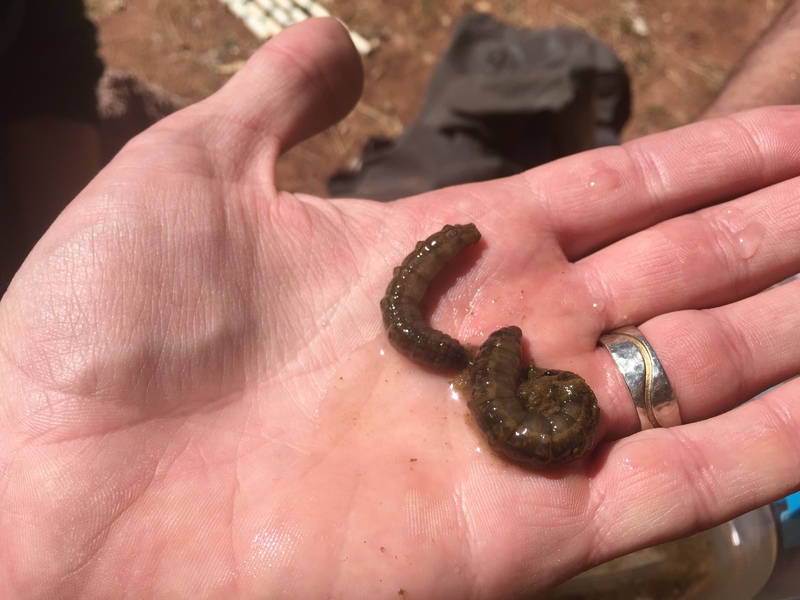 We found some very interesting benthic macroinvertebrates this time. 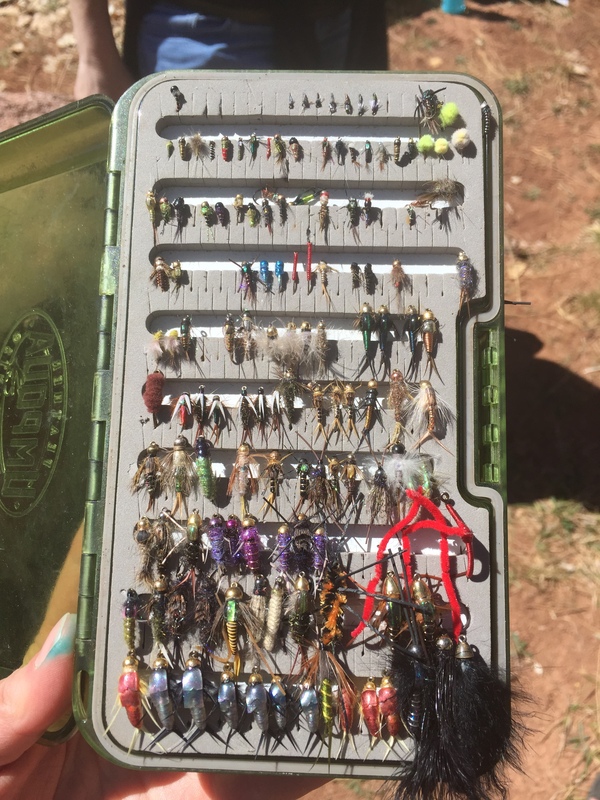 There were quite a few fly fishermen around, and one of them showed up his fly box. These little guys look familiar! A box full of fake benthic macroinvertebrate. All in all, it was a fabulous day. The weather was gorgeous, everybody was engaged, and I think we all learned a lot. Next month we’re on to wildfire! Teaching science can be really intimidating, especially for teachers who may not have taken many science classes. Trying to teach place-based science is even harder when you’re a teacher who moves to a new place! 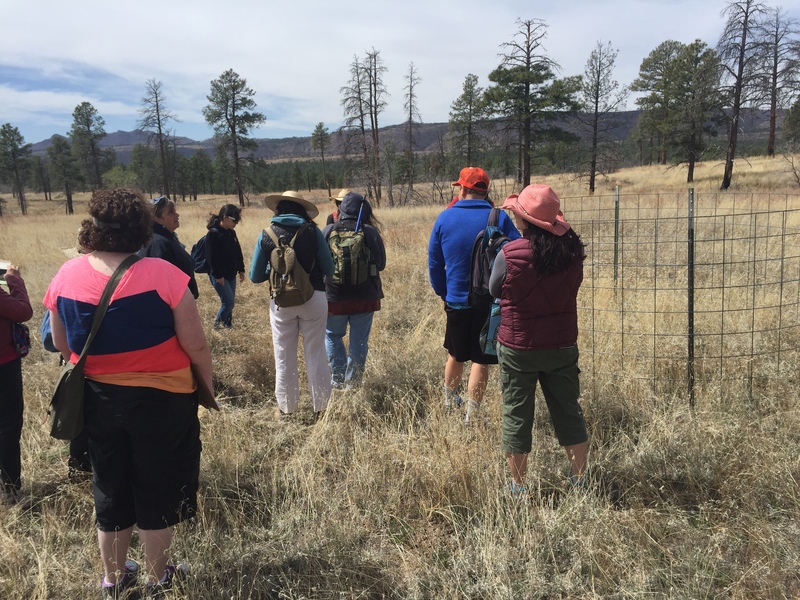 This spring and summer, NMWC is teaming up with Northern New Mexico University to host a series of teacher training events for charter school teachers at La Tierra Montessori School and McCurdy School. This training is part of the Improving Teacher Quality Grant from the Title II New Mexico Higher Education Department. 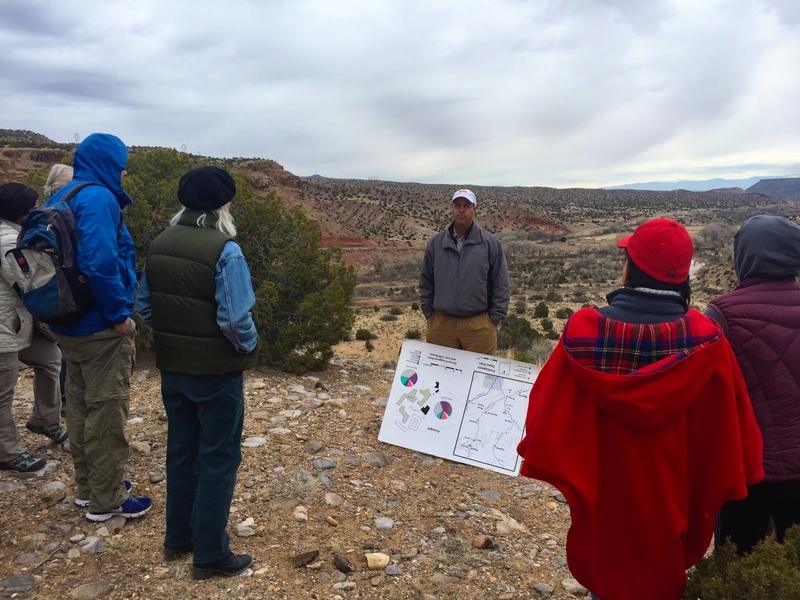 Last Saturday was our first field trip, and after meeting at NMWC and discussing the basics of geology, we hopped in the van and headed north to Ghost Ranch. 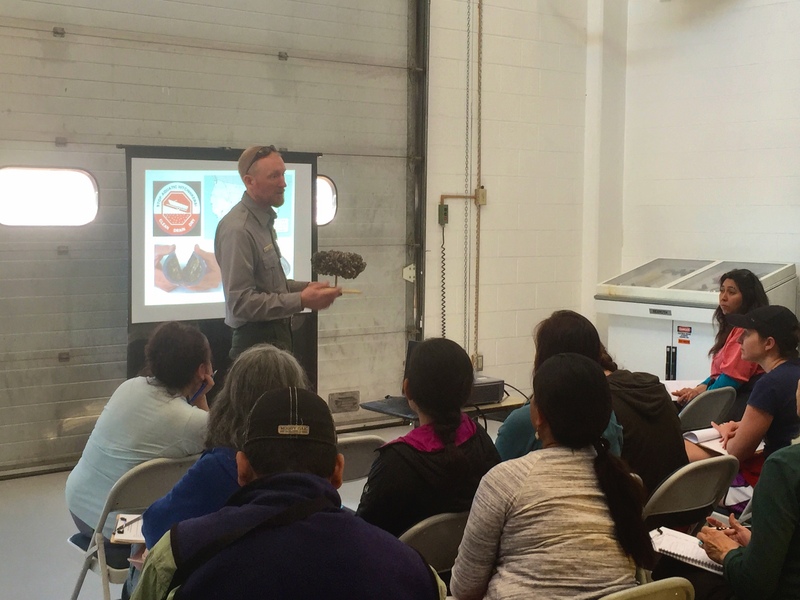 There we met NMWC’s favorite local geologist, Kirt Kempter, who spoke to our teachers about the Colorado Plateau and the Rio Grande Rift. 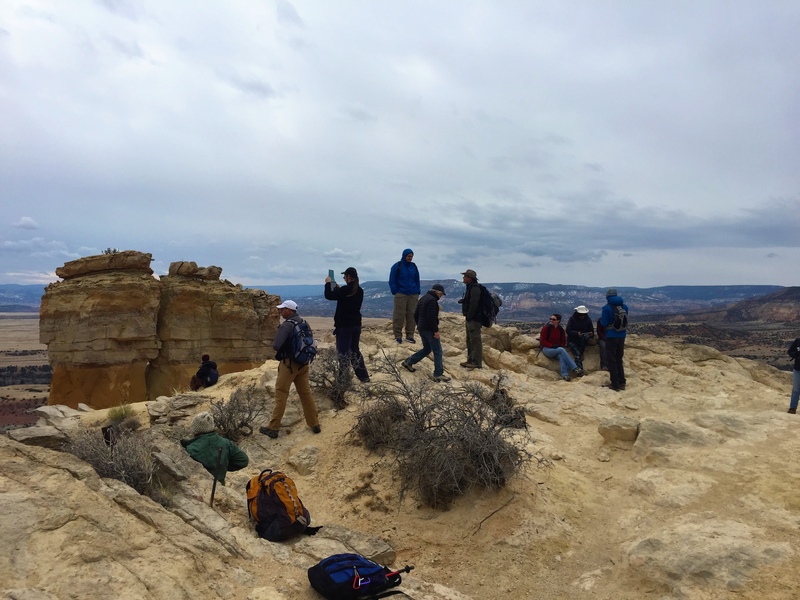 Together we hiked Chimney Rock, stopping along the way to discuss Entrada Sandstone, the Todilto Formation, and coelophysis (seal-oh-PHY-sis). The views along the hike were incredible. Despite chilly weather and strong winds, everybody made it to the top! 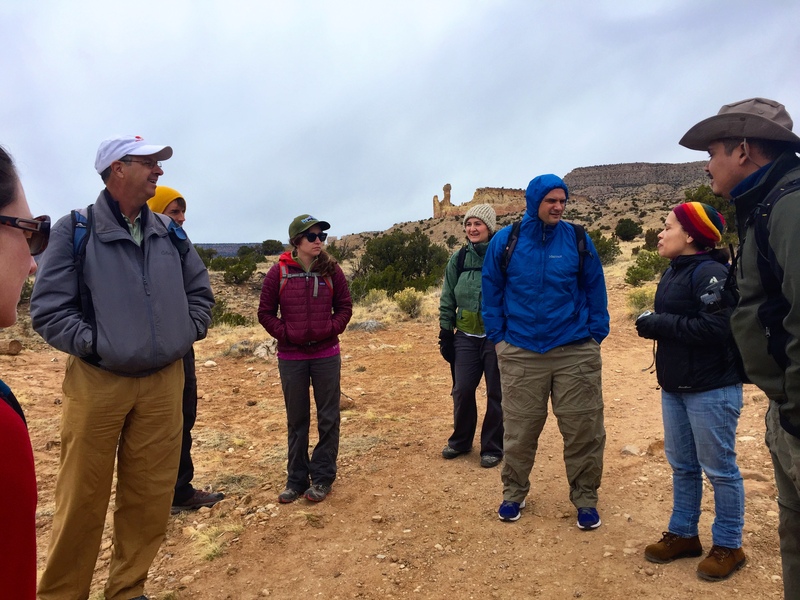 The group ate lunch on top of Chimney Rock and began the trek back down to Ghost Ranch, where we were treated to a tour of the Museum of Paleontology. 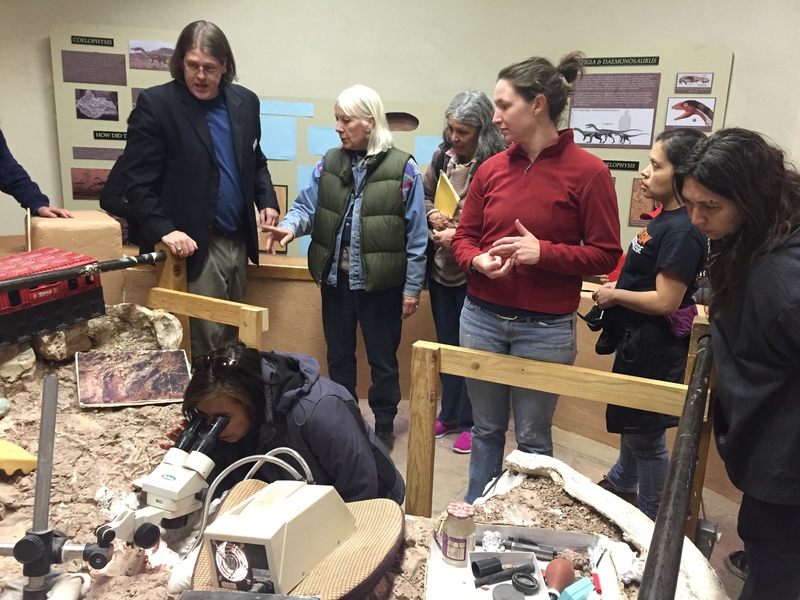 Chris, the museum director, explains how the fossil vancleavea was found. The teachers in this group aren’t just science teachers. 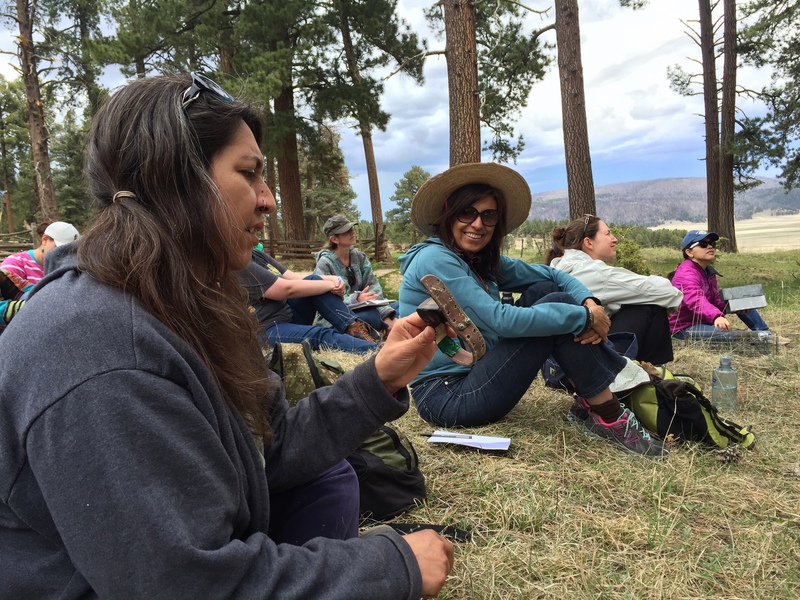 They’re art teachers, language arts teachers, and math teachers, and every single one of them was able to think of some way to incorporate local geology into their lessons. All education is environmental education! 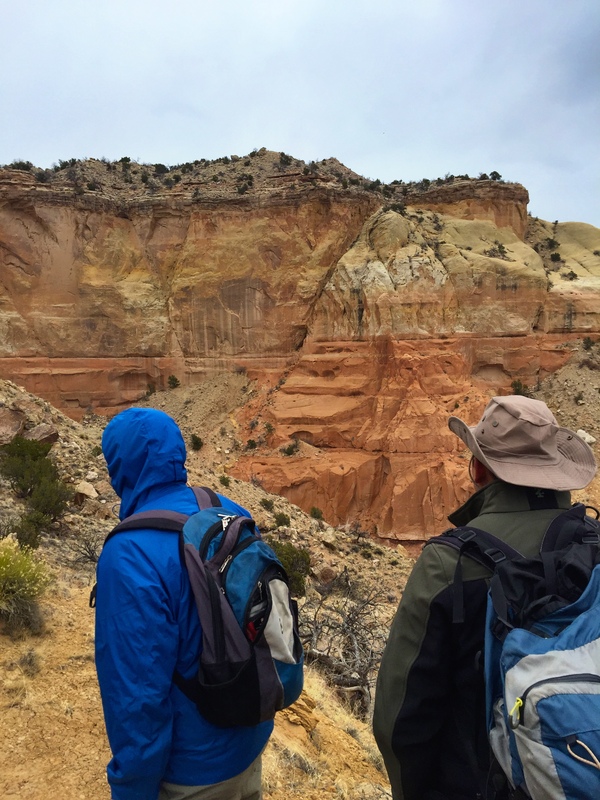 If you would like an overview of the geology at Ghost Ranch, check out this link.